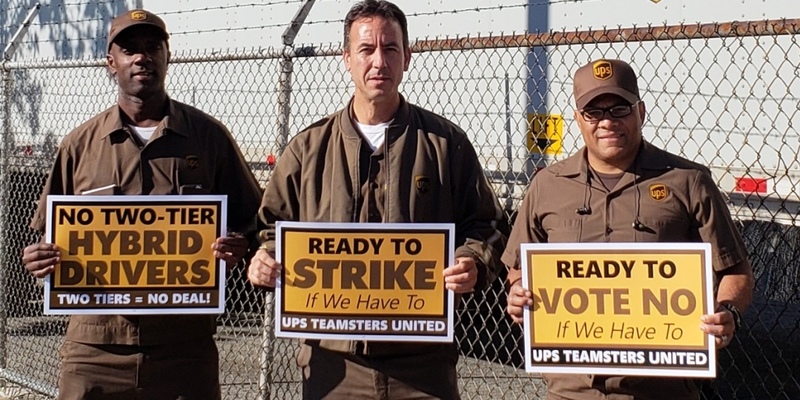 At 8 PM on June 5, members of the International Brotherhood of Teamsters (IBT) employed at United Parcel Service (UPS) voted overwhelming to authorize their Bargaining Committee to call a strike should no deal be reached on their national contract this summer. With a YES vote of 93% in the package division and 90% in the freight division, rank-and-file Teamsters sent a clear message that they are willing to fight to protect and advance their working conditions. Unfortunately, the Teamster leadership has not seriously prepared the ground for a strike, and now a tentative agreement is going to the membership for a vote. With the introduction of hybrid drivers, insufficient pay increases, enforced 70-hour weeks, and the clear anger and motivation of UPS workers, Socialist Alternative calls for the largest “No” vote on this contract. We say – send the negotiators back to the table to get a stronger offer! In the meantime, using the example of the preparations for the 1997 UPS strike, Teamsters should start organizing internally and externally for the possibility of a strike in the future. The potential power of UPS workers, particularly in the case of a strike, cannot be overstated. With 260,000 unionized workers, UPS is the largest private organized workplace in the U.S.. Moreover, UPS itself is a significant component of the U.S. economy that is often overlooked. UPS transports up to 6% of U.S. GDP, and 2% of global GDP, making it a key point of leverage on the entire U.S. economy. A major part of this is due to the rise of e-commerce. As brick-and-mortar retail stores begin to flounder, more and more purchases are made through online retailers like Amazon, meaning someone has to ship those products from producer to warehouse, and warehouse to consumer. 30% of Amazon’s package volume is handled by UPS, and in 2016 UPS handled 275 million pieces for the U.S. Postal Service. In the event of a strike, the infrastructure simply does not exist to handle the billions of commercial transactions. The effect of the strike authorization on U.S. companies has been palpable, with companies from Amazon to local retailers struggling to find alternative shippers. In addition to its economic centrality, UPS represents a crucial lever for organized labor for another reason: the persistence of large, concentrated workplaces. Precisely as outsourcing and online retail have scattered production and consumption, the logistics sector has become larger and more concentrated. Amazon, for instance, has constructed hundreds of distribution hubs and fulfillment centers in order to keep up with demands, and has hired hundreds of thousands of workers to staff them. Kim Moody, a founder of Labor Notes, wrote in 2016 “Eighty-five percent of the nearly three-and-a-half million workers employed in logistics in the United States are located in large metropolitan areas — inadvertently recreating huge concentrations of workers in many of those areas that were supposed to be ‘emptied’ of industrial workers.” Workers have not been atomized into oblivion, as some have predicted, but have become concentrated in a new sector. At a time when the neoliberal era was in full swing, the 1997 UPS strike showed that organized labor could still paralyze a giant like UPS. Under the banner of “Part Time America Won’t Work,” the ‘97 strike won 10,000 new full-time positions, as well as raises, protection from subcontracting to non-union workers, and stopping a UPS scheme to take over pensions from the IBT. At a time when the erosion of secure full-time employment in the U.S. was already being felt, this slogan reverberated throughout the population. Package drivers were also able to use their unique position to “run their routes,” delivering the message of decent jobs rather than packages to their customers. The AFL-CIO and various labor organizations in the U.S. declared their support for the strike, with janitors and other organized employees blocking deliveries to their employers by UPS strike-breakers. In Europe, unions representing UPS employees across the sea organized solidarity actions. Opinion polls showed that Americans supported the strike by a 2:1 margin. Much of the success of the ‘97 Strike was due to the leadership of Ron Carey and the Teamsters for a Democratic Union (TDU), a more militant caucus that developed out of the rank-and-file movements of the 70’s. Carey’s surprise 1991 victory usurped the IBT old guard in the first monitored, rank and file election in the union’s history. The Carey-led Teamsters organized contract rallies to bring members more directly into the process of formulating demands, distributed questionnaires to membership, and developed extensive person-to-person communication networks with volunteers and shop stewards to keep membership updated and alert. Using the resources of the full organization, the Carey leadership was able to mobilize locals , ended the policy of secret negotiations, and managed to work around resistance from many old guard holdouts. The experience of 1997 points the way forward for a new surge in labor struggle. This has already begun, with the success of teachers strikes across the nation and Boeing workers organizing in South Carolina. Bold demands, rank-and-file mobilization, and a willingness to use all the tactics at labor’s disposal can deliver far more for the working class than any amount of backroom deals or corporate politicians. With UPS’ unprecedented leverage over the U.S. economy and the rising anger of a well organized workforce, one would think that the current contract negotiations would be a field for bold threats and bolder demands from IBT negotiators. Unfortunately much has changed in the last 20 years. An investigation into Carey cost him the subsequent leadership election, and TDU was replaced by the old guard under James Hoffa, son of the notorious Jimmy Hoffa. The younger Hoffa has avoided flexing the muscle of Teamster labor, and instead pursued a strategy of concessions to the bosses, supposedly to preserve jobs and avoid worse conditions. A challenge was fielded to the concessionary unionism of Hoffa in the 2016 leadership election by the Teamsters United Slate of Fred Zuckerman and Sean O’Brien. Supported by the TDU, it carried over 70% of UPS Teamsters, but lost in the IBT overall in an election which has drawn some suspicion of corruption. Under Hoffa’s leadership, many of the old practices have re-emerged. Rank-and-file membership are left in a “Brownout,” with details of the negotiations kept secret. Recently, it was revealed that concessions to UPS on the table included forced 70-hour work weeks for drivers, “hybrid drivers” who perform other tasks in addition to driving for lower pay, and Sunday deliveries. These come from the IBT’s negotiating team, not UPS! Denis Taylor, the IBT negotiator for the 2018 contract, has been a lightning rod of resentment for the rank and file for such massive concessions, the secrecy of negotiations, and his crackdown on members of the negotiating team that leak information or otherwise dissent from the conciliatory path. While the creation of hybrid drivers is framed as a way of taking a burden off of current drivers, the creation of a lower tier of driver opens the door to fully-paid, fully-protected driving jobs being phased out, just as the option of part-time positions has been used to phase out a full-time workforce in areas like package handling. The IBT leadership unfortunately has echoed the talking points of spokespeople for UPS, who have weaponized the rise of Amazon and its atrociously maltreated workforce, using it as an argument that Teamsters must make concessions to keep UPS competitive. Despite UPS having made $4.9 billion in profits in 2017 and being on course to make record profits in 2018, the company is cast as an endangered entity that cannot survive its employees’ current compensation, let alone any improvements. In a letter put out along with the strike authorization ballot, the IBT made their call for a strike authorization as non-committal as possible, with language such as “nobody wants a strike; it hurts the company and it hurts members” and “a strong strike vote can prevent a strike.” Even if the IBT were to call a strike, the Hoffa leadership clearly does not intend to put in the necessary effort to prepare internally for a strike, or to build a solid public relations campaign to build wider support. There is waning faith that the IBT will actually call a strike, even if its members reject a contract proposal. TDU has been making efforts to organize contract rallies, educate members, and otherwise push for a better contract and better strategy for winning it, but they face strong resistance from IBT leadership. Another danger looms over the potential for a strike. Under the Taft-Hartley act of 1947, the President reserves the right to intervene in a strike that might create a national emergency. During the ‘97 strike, there were calls for President Bill Clinton to make just such an intervention. Clinton refrained, but Trump has shown little concern for public outrage at his actions, and has the support of both houses of Congress. While a more militant union leadership might welcome a confrontation with Trump in order to unite with the broader anti-Trump movement, the Hoffa leadership appear more afraid of ending their cozy approach with UPS management than representing the interests of their members. Show the World What Workers Can Do! Socialists point to the IBT’s immense potential power to mobilize the UPS workers around massively popular fighting demands that will also electrify the wider working class. This includes $15 an hour base pay for part timers, with their accumulated progression added on to this new floor. Rather than lower-tier hybrid drivers, more full-time, standard positions to take on increased volume, and allow drivers to limit themselves to an 8-hour day, to reclaim their non-work lives. Strict enforcement of weight limits, more full-time non-driver positions, and lowered work paces should also be part of what the union demands. Organizing around these demands will help workers to rebuild the internal democratic structures that are essential to successful mobilizing for a contract campaign or strike effort. UPS Teamsters should vote a resounding “No!” on the current proposal, and send the negotiating committee back to the table to demand a contract that reflects their needs, power, and importance. Strike preparation, using the model of the 1997 strike should begin immediately as the best way to build the fighting capacity of UPS workers today – strike or no strike. We must fight for the best contract possible to build the confidence of the working class, and inspire organizing efforts at Fedex and, most importantly, the emerging behemoth that is Amazon. Mobilization and internal organizing like 1997 to build for a win. Next articleActivists Successfully Block Downtown Seattle ICE Office in Peaceful Civil Disobedience!